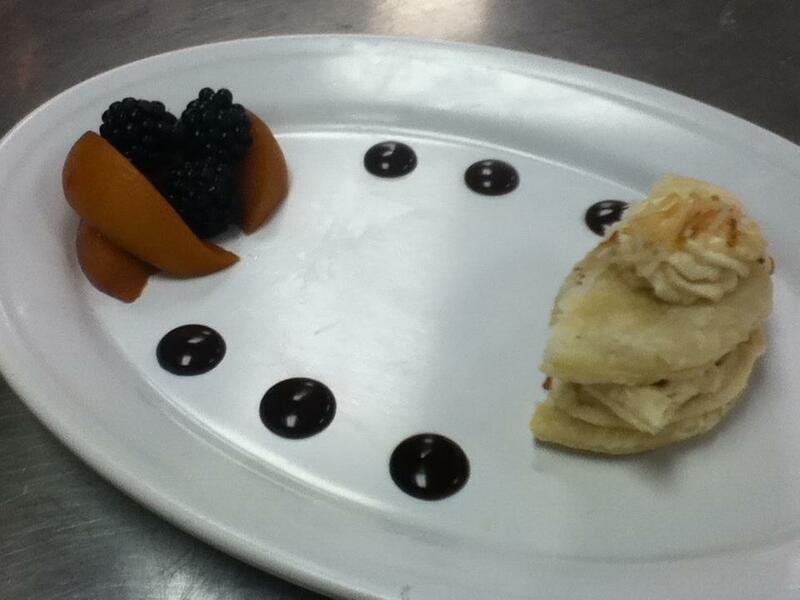 As instructed by my chef, I made sure not to use any traditional flavors of Creme Brulee…or even textures. I started out my adventure by toasting some Almonds in some butter with Ginger. Once toasted, I added Honey and quickly worked to place the Almonds in the bottom of my gratin dish. Once cooled, the Almonds melded into a crisp candied bottom layer. For the traditional Creme Brulee custard filling, I began by heating my dairy with a bit of Saffron. The Saffron was my supporting actor to the main star of the custard…the sweet Blood Oranges. To compliment the Blood Oranges I added a dash of Honey, which draws hints back to that bottom layer of Honey encrusted Almonds I mentioned earlier. This all leads to the final component which is, of course, the notorious crunchy top layer. No matter how amazing the creamy citrus custard was underneath, I received most satisfaction from torching the sugar. Nothing is better than playing with fire in the morning to ease your culinary frustrations. 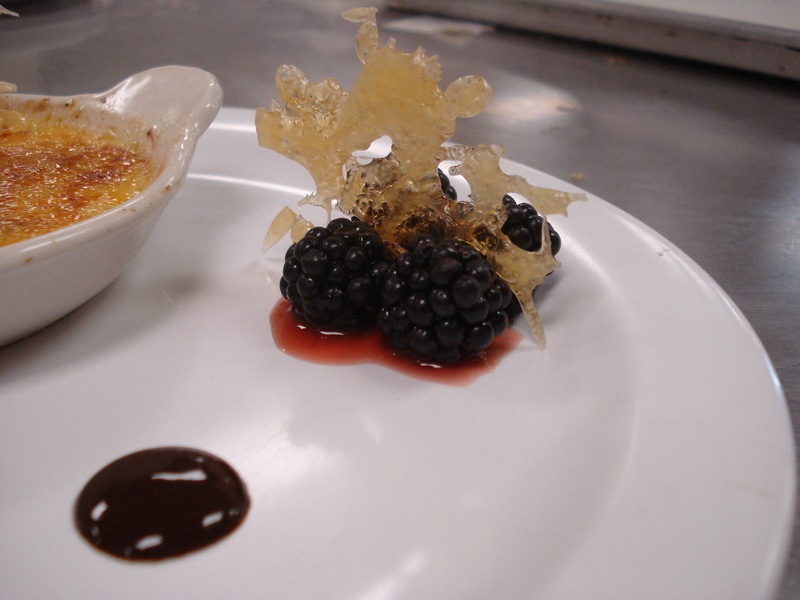 Regardless of my bad relationship with Creme Brulee in the past this one turned out quite delightful. 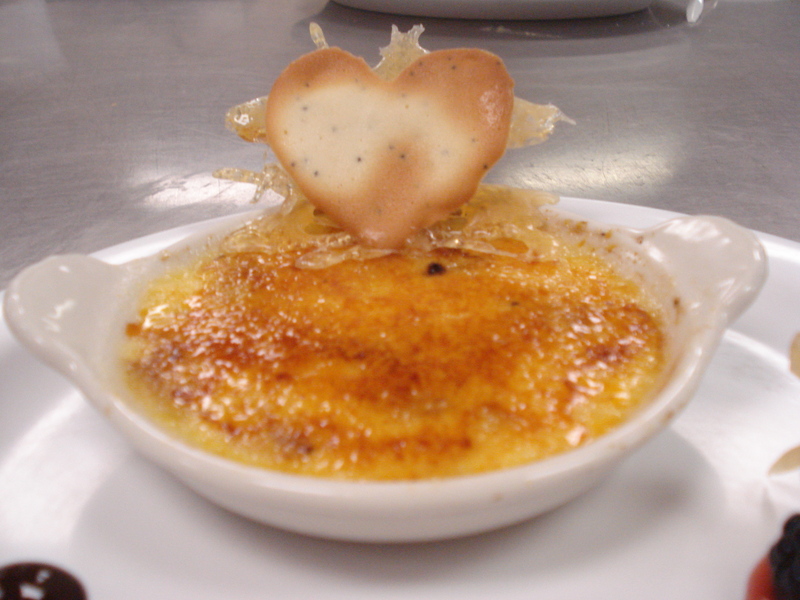 I finally think Creme Brulee and I can maintain a lifelong friendship. 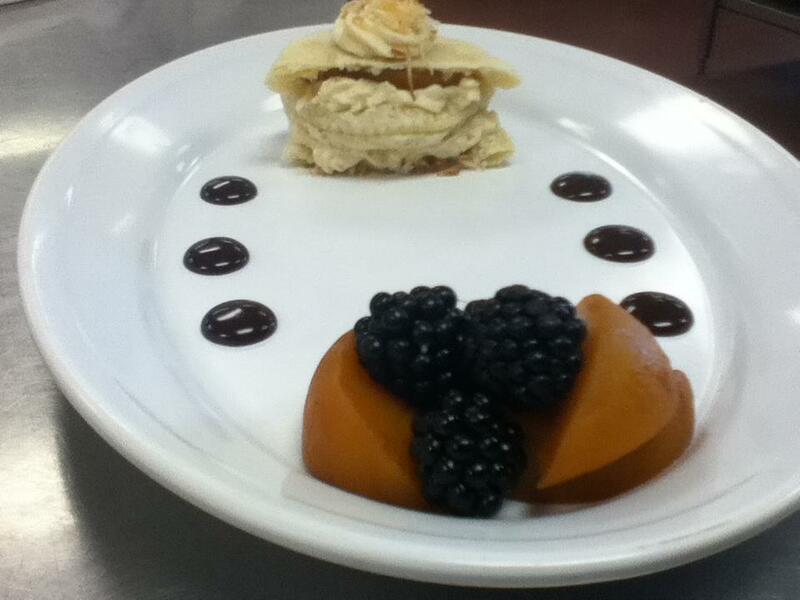 The finished custard is certainly a perfect representation of how to use Central Florida and it’s Citrus! 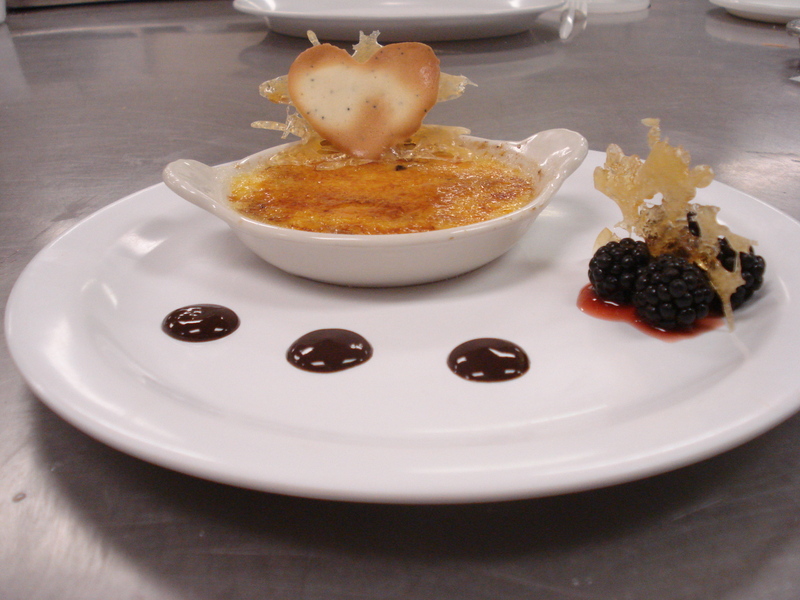 To add height to the sweet and crispy custard, I created a heart-shaped Tuille flavored with Myer Lemon juice and Poppyseeds. The Tuille’s heart shape was created by drawing a heart on a hard piece of cardboard or thick paper and creating a stencil. I then made a small batch of Tuille batter (a little goes a long way…tuilles are very thin and require very little batter to fill the stencil). I laid the stencil down on a parchment lined baking sheet and using my offset spatula, spread an extremely thin layer of Tuille batter (also known as Stencil Paste). 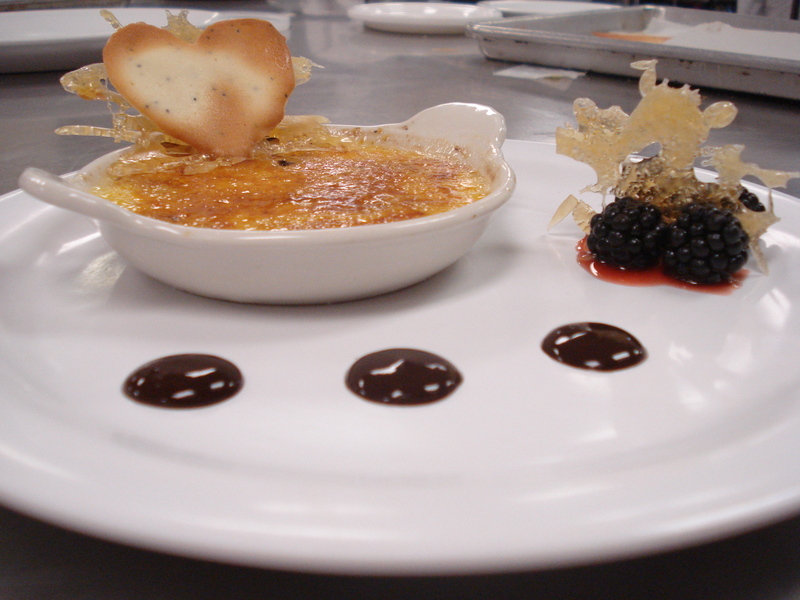 My Tuille Heart is then held upright on the Creme Brulee by two pieces of Spun Caramel, which I fused together to created a pedestal base. To minimize waste and utilize my hard work of battling boiling hot sugar (290° to be exact), I incorporated the Spun Sugar into a decorative adornment for the plate. 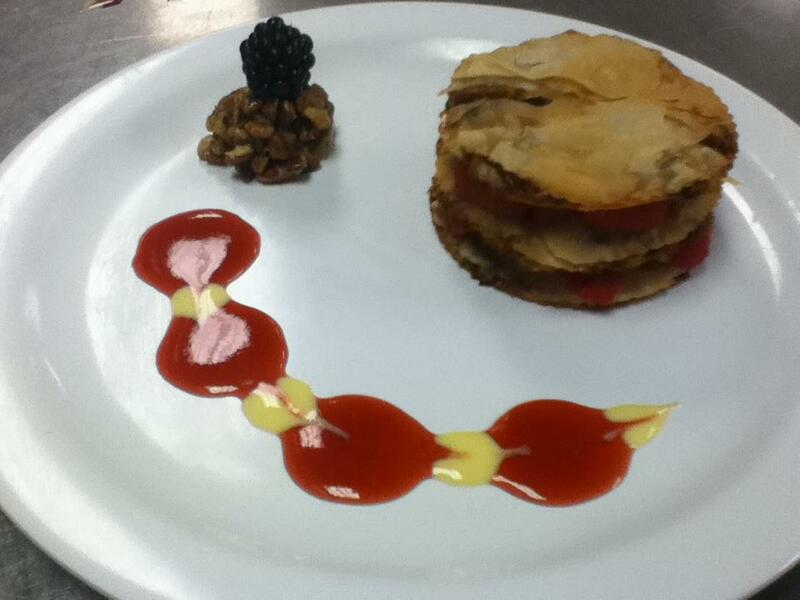 I started by ladling a small amount of Strawberry Rhubarb Rum Coulis into a circle. 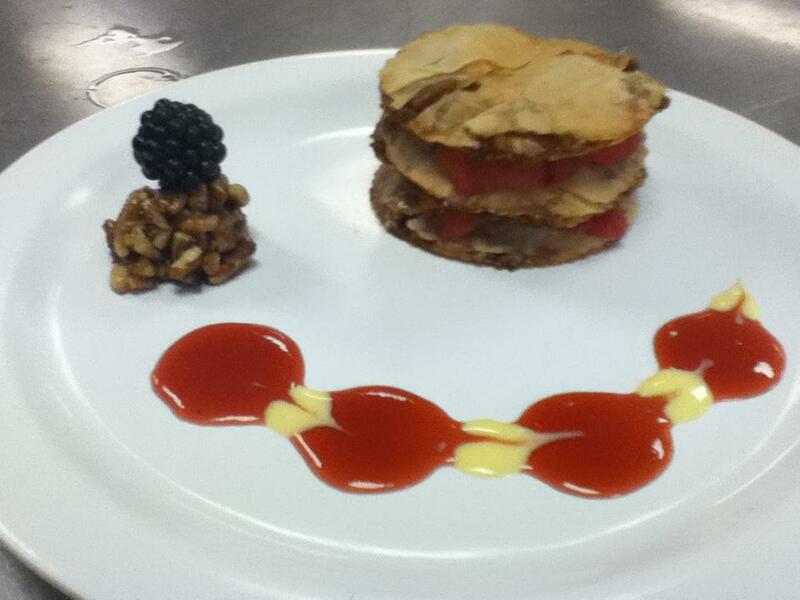 I arranged four blackberries on top, two on each side to hold the Spun Sugar piece. 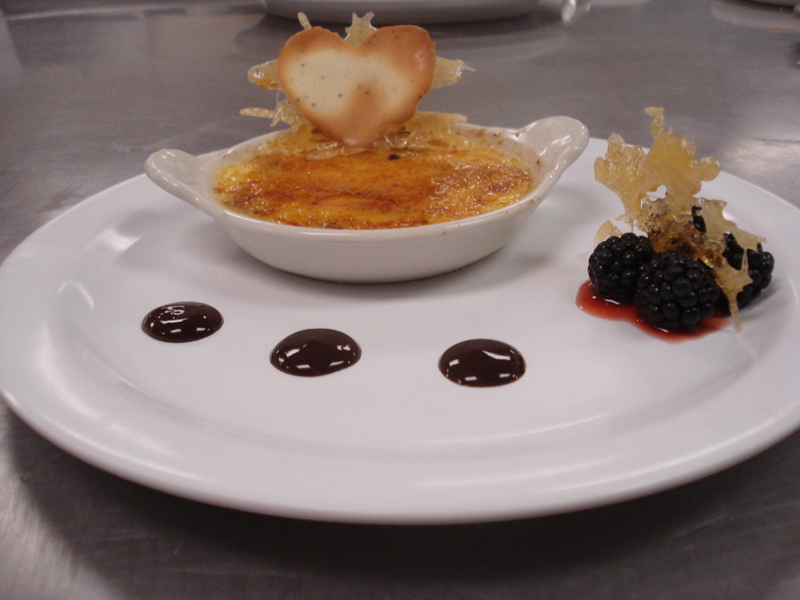 To draw the eye to the decorative adornment, I placed three dots of Chocolate Sauce flavored with Tangelo and Orange Blossom leading toward the decor and also framing the front of the gratin dish of Creme Brulee. Even with all the stress of the day I am pleased with the outcome. I am so ready for the weekend. 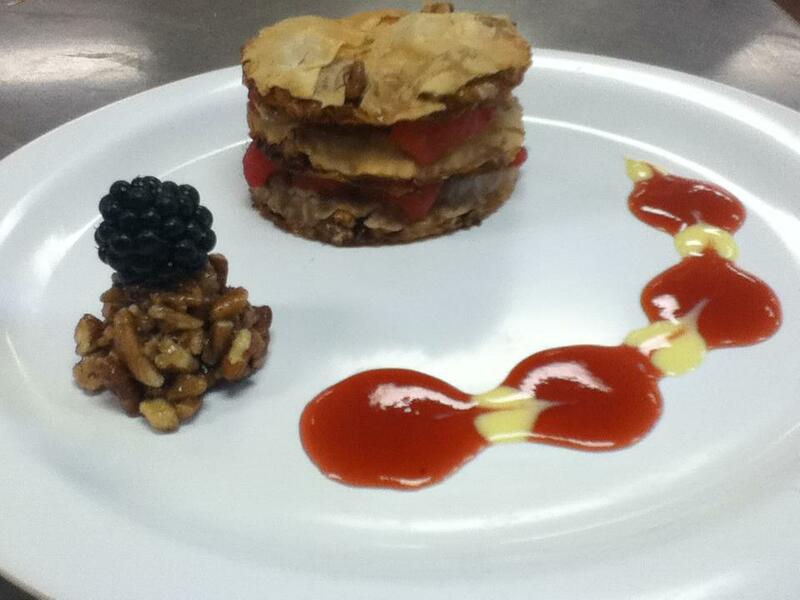 I must plan for next week’s plated dessert following dietary guidelines. Since I am lactose intolerant I will most likely utilize that special dietary concern but am unsure what to choose as the other. Much research is in store along with costing sheets and possible baking sunday at home. 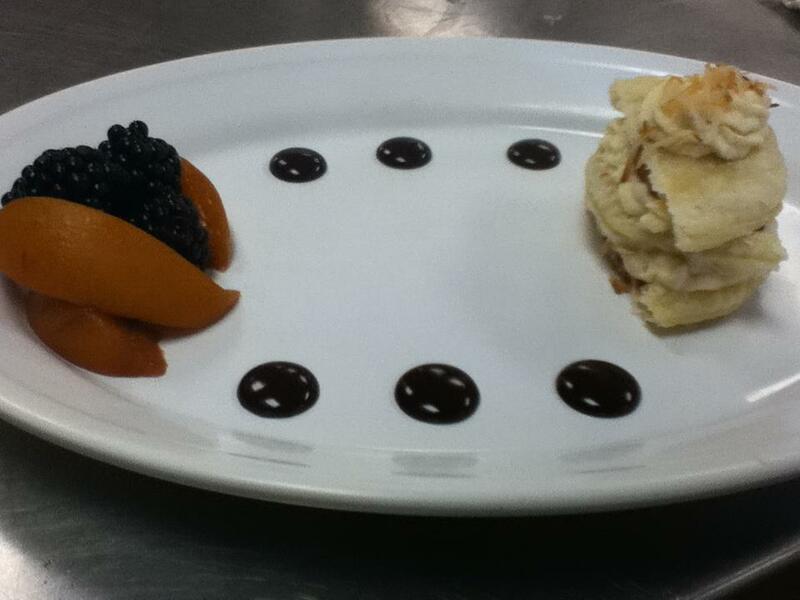 If I am not able to bake sunday then I will see you all back here next friday for another installment in Dessert Plating.